Living Online: Cheating Users Or Cheat Users? Cheating Users Or Cheat Users? 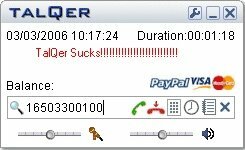 I remember I wrote a report that talk about Talqer VoIP service last month. I tried its free phone call before I wrote, it was very good quality, and easy to use. But after I used Paypal to buy Talqer credit, my account has no any credit. I wrote email to Talqer several times, they told me just wait 3 or 4 days they will fix this problem that cause they can not distinguish between paid user and cheating. I paid $10 dollars for buy credit but now my account is "pending transactions". I can not use Talqer to call anywhere. I was very disappointed with Talqer, I think I do not want use it again.